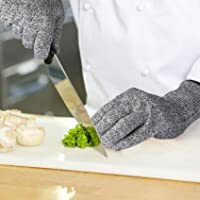 DURABLE CUT RESISTANT GLOVES:Get 2 pairs (4 pcs total) of gloves made with the highest level EN388 certified 5 cut, chop and laceration protection material to protect your hands in a variety of situations.5 times stronger than leather or universal cut resistant gloves,cutting gloves,knife gloves,wood carving gloves,oyster gloves and so on. EXCELLENT COMFORTABLE:Dexterity to wear and grip with a snug fit for small and large hands,flexible operation,No sliding. The special high elastic nylon is blended to make the gloves fit your hand so well. MULTIPLE USES:Ideal for kitchen use-cutting,slicing,shucking, carving, peeling working with mandoline slicers, knives, cutters, graters.Also perfect for garden, mechanic and construction work, fishing,carpentry woodworking, carving,oyster shucking, and so much more. 100% SATISFACTION GUARANTEE- YINENN cut resistant gloves with 1-Year Manufacturer's Warranty and 30 days no-questions-asked return policy. Value for money guaranteed So what are you waiting for, get one today risk free by adding this item to your cart!You won't be disappointed!